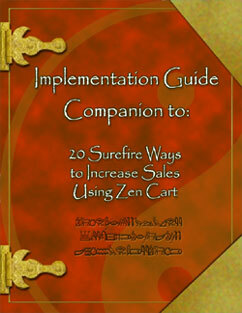 Since the release of the book 20 Surefire Ways to Increase Sales Using Zen Cart, I have had hundreds of requests from readers asking me to implement the template changes featured within the 20 Ways on their site. As a result, I have created the “Zen Cart Template Conversion Pack” to help everyone benefit from and easily implement the template changes yourself. Graphic “Action” Button Files ready for testing with your site. Currently, the Conversion Pack includes templates that work with Zen Cart version 1.3.x and up. I have implemented these changes on 1.2.x sites as well, but because the older Zen Cart versions were table structured, the alterations in the enclosed package will not work. However, if you have an older version of Zen Cart (1.2.x) and would like these implemented, please contact me using the form on this website and let me know. I can arrange for you to get that version. The template files in this pack have been tested over a large number of sites. They include some of the industry’s “Best Practices” and should help bring some of the major problems spots on your e-commerce site up to “standards”. Testing has shown these templates to decrease cart abandonment once a user enters the checkout process, and help increase conversion by more clearly identifying what is required of a customer in order for them to complete the purchase. Keep in mind that all industries and markets are different, and there is no substitute for continued testing, solid market strategy, and a product with a demand. The proven strategies implemented within these templates are a starting point to give you the best chance at success. I know you will find them very beneficial and helpful on your quest for better conversion.